Larry Berry came to us from a terribly overcrowded situation in Pahrump, Nevada. He's used to being around other cats, but sometimes the bigger, more assertive males can intimidate him. Born in 2005, he's come a long way since he's been at the Sanctuary. Although easily startled, he loves getting attention from people. He's always ready for pets and a lap to call his own. 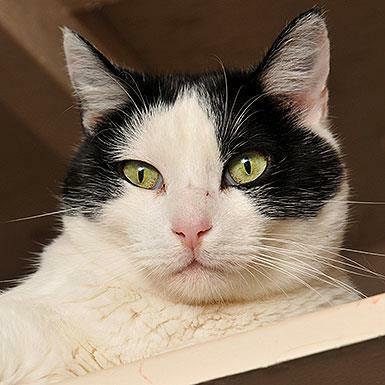 Larry Berry is a Caturtle, also known as a shy cat who comes out of their shell in a home. Caturtles are free to adopt and can fly to their new homes for free anywhere in the U.S. or Canada.